Autumn is the perfect time of year to really get in there and give your whole car a deep clean. It’s not too hot like the summertime, when air-drying a car might result in spots and soap streaks, and it’s right before the frigid winter months. When you’re living in NYC, you understand: salt, dirt, snow, and ice can slowly destroy your vehicle. Make sure your car’s exterior is in good shape and its interior is comfortable during the winter by focusing on doing the hard work now. Even according to the experts, the best car wash is a hand-wash. However, instead of using the popular solution of dish detergent and water, invest in an actual car wash solution; dish soap cleans the car but strips away protective wax coatings. 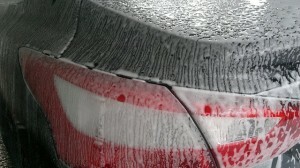 If you do decide to use dish soap and water, be sure to wax your car right after. Also, don’t just use a kitchen sponge, which can scratch your car; get a nice, soft sponge made for this express purpose. I’m not about needlessly spending money and would often rather do a cheaper, DIY project, but it’s important not to cut corners when you’re treating your car’s paint. Every few months (or whenever possible, really), put a fresh coat of wax on your car. This will help protect your vehicle from the relentless salt and snow that will happen over the next few months. Remember that besides cleaning, you’ll want to do several other things to winterize your vehicle, such as checking your wiper blades, your tires, and your air filters. Something that a professional can do for you (I don’t advise doing this yourself) is an under-body coating, which protects all of the parts underneath your car with a coat of sealant. With these tactics and these tips, you can have a more comfortable and safer winter in your car! This entry was posted in car cleaning. Bookmark the permalink.